As a child born in the 60s, I grew up learning that Neanderthals were a precursor to humans today. That could have been more urban legend than scientific error, but then somewhere along the way, I learned that I should stop calling my brothers Neanderthals because there was no relation. But research recently published in the journal Nature shows that Neanderthals did contribute to homo saphien DNA. So, there was and is a connection. 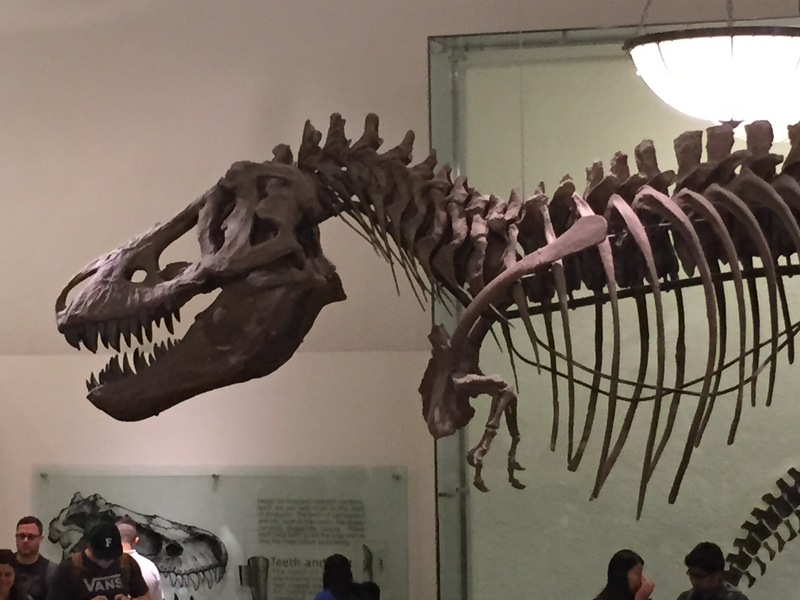 These bones, these fossils were so old—thousands and thousands of years old—and yet, if permitted, I in 2015 could touch them. I could touch something from the Jurassic Age. Does that blow anyone else’s mind? A chaotic walk back to Times Square is like a Star Trek “Beam me down” moment. 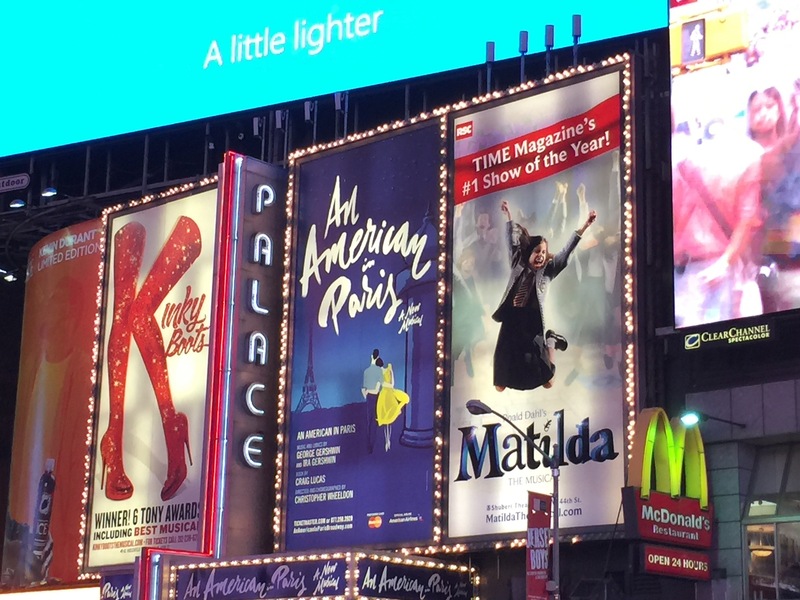 Times Square is really just the spot where Broadway, 42 Street and Seventh Avenue meet in NYC. The name pays homage to the New York Times when Albert Ochs moved his newspaper to Longacre Square. The newspaper nickname name stuck, and although today it has little if anything to do with The New York Times, it has everything to do with the conceptual nature of time. In the United States anyway, it is the place of a definitive moment in time. That is, as one year changes to the next, an Irish crystal ball descends on cue at the precise moment we humans believe one measurement changes to the next. The most gifted poet could attempt to describe the media screens that are 7 stories high and a city block long, but nine times out of ten, I think words may be wholly inadequate. Times Square represents the very newest technology, advertises the most current fashion and trends, and saturates a population carrying their own personal technological advancements trying to capture the outer and inner human experience all at once. Time Square seems to bend (if not break) Nature’s laws—turning night into kaleidoscope of day with the light pollution so condensed, astronauts can see it from Space. (There I go again circling back to space.) It is where modern art, power, and money meet is the most ostentatious, hypnotic way. And I believe it is a metaphor for the way Westerners now think and move and communicate. It is a frenetic, mesmerizing time warp. The other day, I was waiting in line to board a ferry to Ellis Island, and I saw man had a selfie-stick turned on him as he waited in line for 30 minutes. He was filming himself waiting in line. Seriously. Of course, he wasn’t the only one with selfie sticks—they are all the rage. But, I have to reflect on the concept of selfie itself as it relates to time. Have we ever lived in a time in which such blatant narcissism exists? I do not ask this in a spirit of condemnation. I just ask. Everywhere I turn, people turn their cameras on themselves, click, and send. These images not only stay in their phones, they are disseminated all over the world. “Look at me! I am having a cup of coffee at the Plaza on Times Square.” This self-reporting of mundane moments of one’s personal time seems to be addictive. The unmitigated popularity of Facebook, Instagram, Twitter—modern highways and byways of information support this view. Why now do we feel the need to document and share our moments in time with people we don’t even know? What drives us to do this? What will be its legacy on time? Is it that we have more time on our hands than any other time in history? And, yet, most days I feel I do not have enough time—the illusion of time. This trip was good timing in that we were able to go to One World Observatory in the first month it opened. Their somewhat hyperbolic slogan, “See Forever,” embodies the elusiveness of time and space. When one looks down from the top of the stunning piece of architecture, one can see Ellis Island, the Statue of Liberty, Empire State Building—really anything in NYC and part of New Jersey. We see the products of time: ornate Gothic buildings, cathedrals, skyscrapers of today and yesterday. Old and new at a glance. 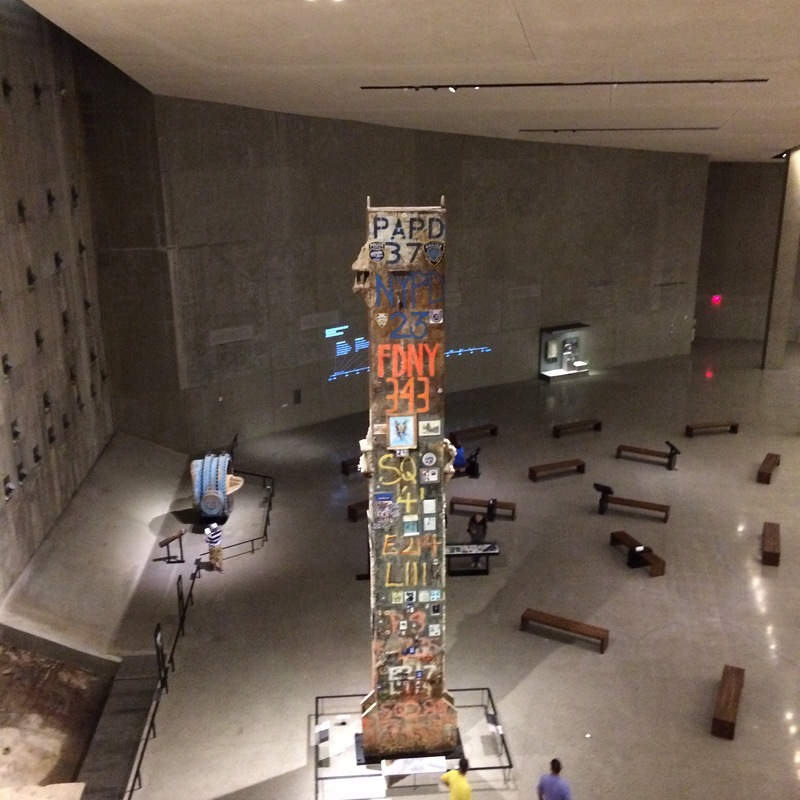 One place where time seemed to stop for me was when we went to the 9/11 Memorial Museum. Outside, the square fountains engraved with the names of every victim from the assault that day guard a perpetual waterfall fountain, the sound of which creates a lulling hush that prompts reflection, preparing one for the reverence needed to remember. When the doors opened this particular Tuesday morning, I was embraced by a powerful silence so essential for a tour that strikes at the core of every sense. The museum itself is built around the structural elements of the Twin Towers. Rusted, burned, mangled steel beams remind us first off of the level of deliberate destruction. Pictures of victims covered in ash, flyers of missing family members, recordings of cockpit communication, calls for jihad, and final goodbyes to family members prick the heart—one’s heart and the heart of the matter. People. These terrorists and victims ruled by love and hate are forever bound together in eternity. Video footage of people leaping to their deaths and ash blanketing a city unsettles the soul. Replays of Katie Couric and Matt Lauer straining to keep calm in their voices because what they were witnessing at the time seemed like a moment in a Hollywood movie—unreal time. Time stopped for me on September 11, 2001, as for most people who watched or listened to the horror. How can mankind be so cruel to mankind? A question Cain and Able brought us from the beginning of time. It is imperative to remember all that is associated with this horrific time so that the cycle of hate can be broken or at least disrupted. I say this with little confidence as I watch the current reports of the Taliban, ISIS, and the senseless shooting at “Blessed Mother Church” in Charleston, SC. Evil is as old as time. Interesting Cara – time becomes more important the older we get doesn’t it? Remember when people use to say to you “Oh, I remember when you were just this big?” I find myself saying that now too. So true about the September 11. I had a 5 month old baby then and was up feeding when I saw the news. I seriously thought the whole world was coming to an end. I couldn’t get my mind around it – just like everyone else. It seems like time is pre – september 11 and post september 11. The Bali bombings were also like that for Australians.